A friend forwarded this opinion to me last week. After reading it, I just laughed at the thought of how incredibly inept and spineless much of the judiciary was in handling Katrina cases. The very last point about in the conclusion, about “all defendants” I find confusing. It seems to indicate that it implies to defendants beyond this one case (all defendants in Hurricane Sandy claims). If that is true, how does someone comply with a court order if they are not one of the parties? Is this a special court that can send out notices to all relevant parties? Down here each case filed against an insurer had its own case number. I think in New York they consolidated the litigation and are adjudicating the cases individually within the consolidated litigation. This case brings up matters involving compliance with the global case management orders thus the judge’s language. The is also salient because the claims practices in play here are said to be widespread. 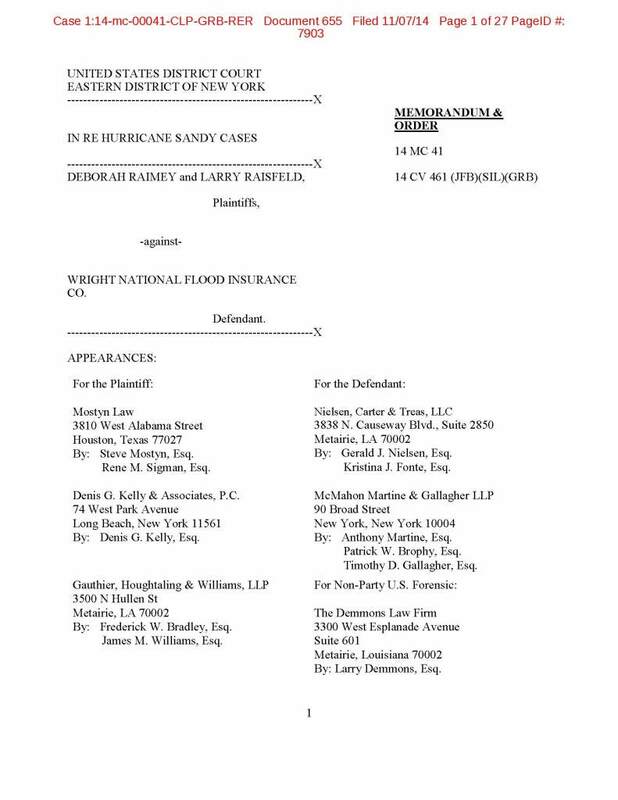 While the policyholder is generally prohibited from recovering attorney fees from the NFIP the people defending the NFIP have the US Treasury checkbook open to them so there is an incentive to litigate for the defense rather than simply pay the flood claims. Doug, in looking at the opinion, and seizing upon that particular language, I started disseminating it to other PI counsel still involved in flooding litigation to point out a potential fraud by defense attorneys in discovery. By the way, you might want to gear up the Jimbo Donelon the Klown watch again. Jimbo is shilling once more for the insurance industry, in an attempt to divert attention from the round of rate increases in the area for auto insurance, contending that insurers roll over and play dead in PI cases and pay out the max (on minimum insurance policies, of course, which is chickenshit money at the end of the day.) Jimbo was on WWL-Radio 870 AM (seems fitting, doesn’t it) on Nov. 19, 2014 doing his best towelboy act for Allsnake Insurance. Of course one can never tell if Jimbo ever takes a leave of absence from his taxpayer funded job to do his shilling for the insurers he allegedly regulates.